On the basic level, the Software-Defined Data Center (SDDC) delivers three basic virtualized services: compute, storage and network. A logical, software-defined layer separates the services we operate, from the underlying physical infrastructure. Hyper-Convergence infrastructure (HCI) refers to the merging of compute and storage capabilities which are managed through a single interface. With software-defined networking added to this, we get a virtualized data center. Management and Automation of the SDDC is provided by a Cloud Management Platform (CMP), such as the VMware vRealize suite. 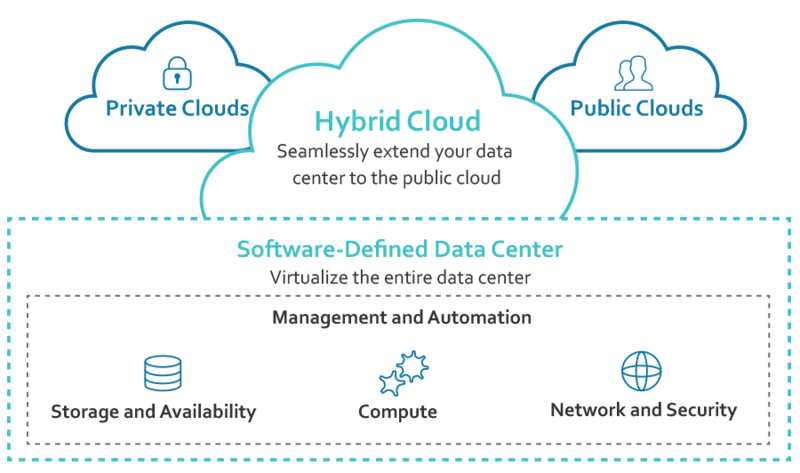 The hybrid cloud means joining together a public and a private cloud by using encrypted connection and technologies that allow data to be portable. Both clouds remain separate and independent. This means hybrid cloud is an environment where the private and public services are used together to create value. The Cloud Management Platform used for the SDDC, for example VMware vRealize, should seamlessly extend to manage and automate public cloud services, such as Amazon Web Services (AWS) and Microsoft Azure. In delivering our service offerings we combine the experience of our IT service operations teams with our Network Orchestration & Automation experts. We help our clients make the most out of new virtualization and cloud management technology. At what point in time is an organization well advised to shift from existing, manually configured equipment, to modern software-defined solutions? What technologies are best suited for the client’s specific needs? These are the type of questions our advisory service consultants help clients answer through highly-effective IT solutions. We deliver software and consulting services and solutions based on partnerships with leading technology vendors. .
We specialize in advanced VMware vRealize management solutions that scale from VMware data centers to hybrid clouds. The hybrid cloud management solutions may also include public cloud services such as Amazon Web Services (AWS) and Microsoft Azure. VMware vRealize Log Insight – Enables real time log management and log analysis. Cisco: Data Ductus is one of Cisco’s leading registered partners in the ATP Network services orchestrator program. We run our internal hyper-converged private cloud services on the Cisco HyperFlex / Cisco UCS platform. Citrix: Data Ductus application management teams deliver virtualized desktops on the Citrix platform for large numbers of clients. When you need support to assess, design and implement your SDDC, Cloud and Virtualization Management solutions, let’s talk.